Supreme Court Strikes Down Part Of Immigration Law The court declared as unconstitutionally vague a clause in the Immigration and Naturalization Act that mandated the deportation of immigrants convicted of some crimes. 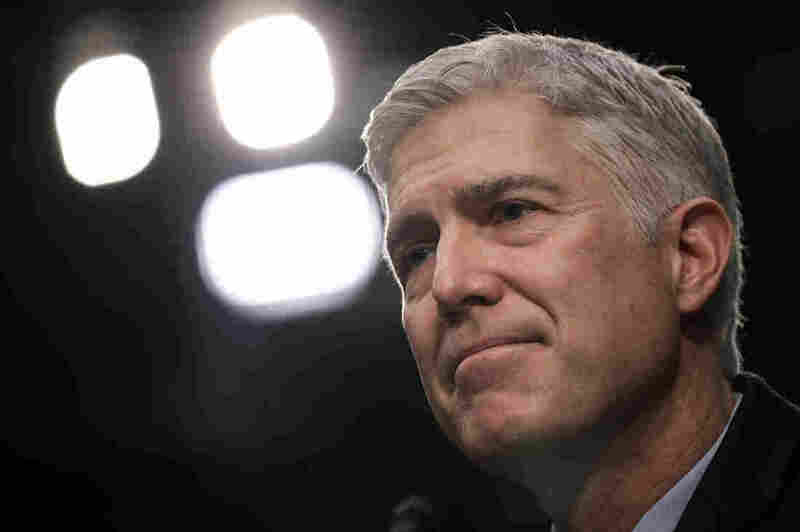 President Trump has hailed his appointment of Neil Gorsuch to the Supreme Court, but Gorsuch sided against the administration Tuesday in an immigration case. President Trump is already tweeting his displeasure about a Supreme Court decision that makes it more difficult to deport a small number of lawful permanent residents convicted of crimes. In a 5-to-4 decision Tuesday, the court overturned the deportation of a 25-year legal U.S. resident from the Philippines who was convicted of two burglaries. James Dimaya came to the U.S. at age 13 as a legal permanent resident. More than two decades later — after he was convicted of two home burglaries in California and sentenced to a total of four years in prison — the government sought his deportation under a "violent crime" immigration law, though neither of Dimaya's crimes involved violence. The statute defines a violent crime as one involving force or the "substantial risk" of force. The Supreme Court, however, said that language is so vague that it invites arbitrary and discriminatory enforcement. Writing for the court majority, Justice Elena Kagan said the ruling is compelled by the court's decision in a similar case, Johnson v. United States — a decision written by the late conservative Justice Antonin Scalia in 2015, a year before his death. Pointing to that decision and others like it, Kagan quoted Scalia from a dissent on the subject of following these precedents: "Insanity is doing the same thing over and over again, but expecting different results." "We abandoned that lunatic practice" the last time the court ruled on this issue, Kagan said, adding that there is "no reason to start it again." Trump appointee Neil Gorsuch, Scalia's successor, cast the fifth and decisive vote, along with four liberal justices. In a lengthy concurring opinion, he said the "Constitution looks unkindly on any law so vague that reasonable people cannot understand its terms and judges do not know where to begin in applying it." The dissenters were Chief Justice John Roberts and Justices Anthony Kennedy, Clarence Thomas and Samuel Alito. Roberts and Thomas wrote dissenting opinions for a total of 47 pages.